The color picker is a component that you may require for the front-end interface for the end users. The purpose can be selecting a color of theme, backgrounds, or other sections of the website. However, color pickers can generally be used in the admin interface for allowing visitors setting the customized theme as per liking. There may be many other uses of color pickers depending on the scenarios and nature of visitors of the website. 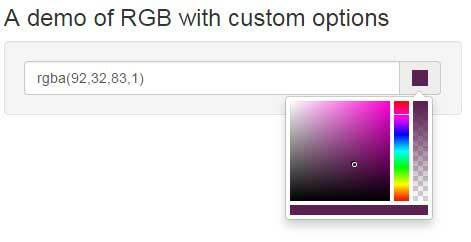 In this tutorial, I am going to show you a jQuery and Bootstrap based color picker plug-in that you may easily integrate into your website. The plug-in is available at the GitHub website and is developed by mjoinic. You may download the color picker plug-in from the given link. In this demo, a simple color picker becomes visible as the input field is clicked. The input field also shows the color HEX value. As textbox is clicked, a small palette becomes visible where you may choose the color. Wherever you click inside that color palette, the value of that color is displayed in the textbox. In the <head> section, include the Bootstrap and bootstrap-colorpicker CSS files. In the <body> section, write the markup of the input field and initiate the plug-in by using the jQuery code. See the complete code in the demo page. Its occurrence is six times in the CSS file, so set the path of images according to the location where you have placed images or img folder, otherwise, color palette would not display correctly. In above two example, the HEX codes are displayed while using the color picker plug-in. In this example, RGB (Red, Green, and Blue) codes are shown in the textbox as you select a color from the palette. In the script section, notice the options used i.e. it takes the value of color and the format is rgba. So, the text field is showing the RGB value of the selected color. You may perform certain actions as an event occurs in the date picker. For example, as the color is changed, you can apply the selected color to a specified element. See the following example where the background color of a div just below the button is changed as you pick a color from the palette. So, at the changeColor event, the selected color is applied to the specified div element. Similarly, you may apply colors to body’s background, table cell or other section of the web page. The plug-in also supports other events like create, showPicker, hidePicker, disable, enable and destroy. As these events occur, you may perform useful actions there. By using the horizontal option as true, you may show the palette horizontally. If you noticed in above example, the palette is vertical. You may also use the alias of the colors for allowing users selecting a color. For example, using the Bootstrap standard colors like info for light blue, primary for dark blue, success for green etc. That way, the small color boxes will be visible to the users as they open the palette. with the alias shown in the text field. 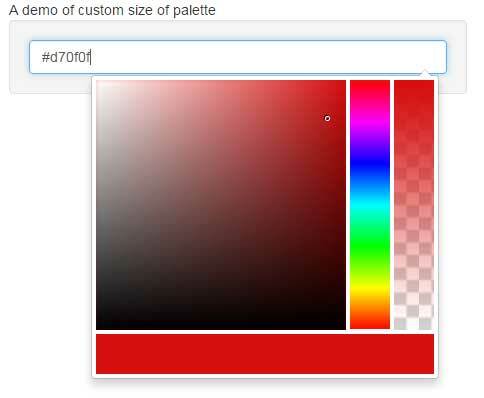 In all above examples, the default size of the palette is used. You may also specify the size by using the customClass option. In that option, you may set the custom class that is placed in the <style> section or an external CSS file. Just specify the file name that contains the width and height properties for the palette. Get the complete code in the demo page.